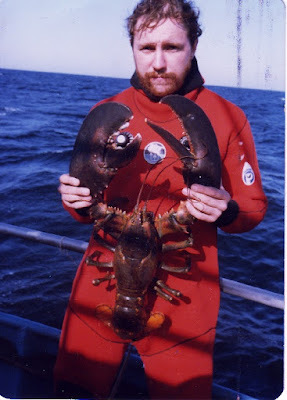 The Art of Lobster Hunting. 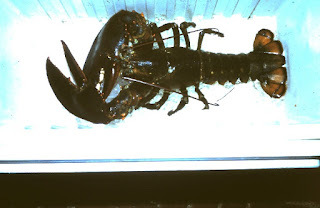 The Atlantic Lobster, Homarus Americanus is the most sought after diver delicacy found on the shipwrecks of New Jersey. The wreck diver’s seafood shopping list can vary from a wide range of fish to scallops, mussels, crabs and clams, but the claws and tail of the Atlantic lobster remain the most desirable entree. The New Jersey coastal waters are a natural flat sandy bottom free of relief, except for a few rare projections of rocks offshore. All other objects of relief are the result of man made error or purposefully placed in specific locations to create artificial habitats or reefs. These unnatural obstructions stimulate habitation of marine life. Here is where crustaceans and fish seek shelter in these shipwrecks and infinite structures forming an oasis from predation by larger species. In the shadows of these structures, the lobster can molt and mate in a relatively protected environment seeking safety in innumerable crevices. In the first year of a lobster’s life cycle only a tenth of their larvae survive floating among other plankton forms. When they finally sink to the sand, the features of these artificial reefs make a welcome habitat for these juvenile crustaceans. There they feed on the small mollusks, fish, less formidable crustaceans and even other lobster. This awesome prehistoric armored animal inspires the imagination. Soft tissued humans wince at the mere thought of their bone crushing mandibles snapping and crimping down on a misplaced digit. A final taradiddle is legendary. The tale is of the boastful and loquacious grandstanding diver whose dockside yarn of his hunting prowess was painfully interrupted. As he stood in front of the dive boat holding up a ten pounder for the gathering crowd, he failed to respect it’s steadily encroaching crusher claw. As the crowd watched in horror, he dropped to his knees in silence with the pincer attached to his thumb. Fortunately the natural instinct of the crustacean is to escape. 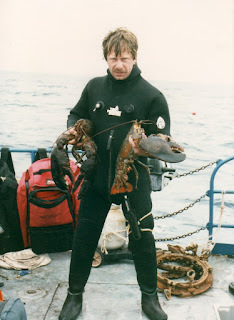 When the diver let go in wordless pain, so did the lobster. I restate these incidents are rare but notable. It is important to have the proper tools prior to your first hunt. A good light is the most important tool. Lobsters hide in the darkened crevices and away from the sunlight.. Their bright reddish orange color contrasts with the rusting and deteriorating wreckage. The preference is the bright hot white HID or Eled hand held lantern lights. These provide a wider view and allow unrestricted movement. Red lens lights are rarely used and offer limited advantages. You only need to see the location of a potential home briefly and a bright wide beam will allow you to see a greater hunting area. Don’t flash the light directly into the lobsters eyes. This will force them back into the wreck and out of reach. Attach the light to your harness D-ring and you can let go to work with two hands underwater. A large mesh bag will allow you to bag your bug easily. Serious hunters choose the half nylon- half mesh bags to reduce drag and to ease the sliding of the bug into the bag. A current legal gauge should be attached to the bag for easy reference. These can be made cutting out an length aluminum or plastic. Dive clean. Eliminate wearing canister lights with a hand mount. Arm slates, compasses and computers also cramp your lobster draw reducing your ability to plunge your hand deep into a hole. Being nimble is important and your ability to react without resistance increases your potential. 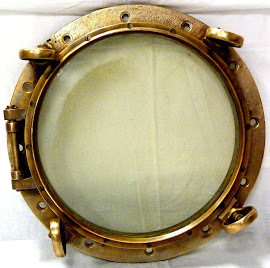 Finally, dive within your comfort level, have the proper safety gear and redundancy for your dive. Adequate gas is a must. You will breath a lot of gas during the heat of the hunt. Over a short period of time new bug divers can develop lobster hunting techniques that will ensure dinner and a healthy matrimony. After your first success, you will be surprised how popular you are. Your neighbor may hand deliver your newspaper, return your ladder, wave as you drive by etc... In-laws will call or drop a card on your birthday. Your teenagers will acknowledge your existence and soon you will be sitting at the head of the table again. You will be remembered at those family re-unions even if you don’t attend. 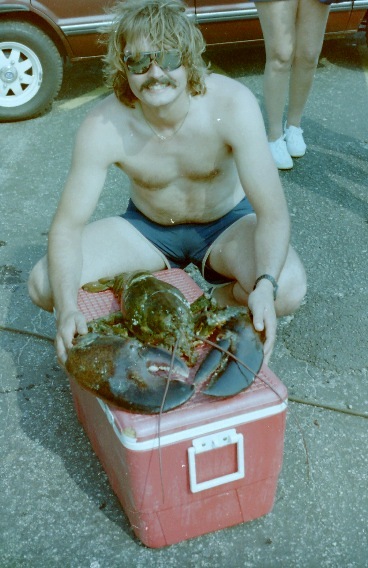 Just send a cooler with a few lobster. You now have the ultimate excuse for any unwanted social outing. Lobster habitat any low sandy or muddy area with a roof. They dig in and mark their home with debris they bulldoze out of these homes. An alert hunter will look for burrowing areas marked with darker mud, discarded mollusk shells and bones littering the hole. These crustaceans can migrate or may remain in that home year round if there is an abundance of food. A home in a paint can be compared to a summer home, whereas a shipwreck with thick mussel growth will be a more permanent fortress. Their behavior is instinctual to make the march offshore in the fall where they can dig into the deeper shelf-waters and return in the late spring to re-find a summer habitat. It is there that they can feed, molt and mate in a protected environment. One can understand that timing the hunt season is important when the diver plans to capture his dinner. If you hunt too early you will find lots of ling cod and ocean pouts occupying those holes. If you go too late, the lobster may have moved off or have already been bagged. Lobsters are known to occupy holes with alternate escape routes. They continually scan with their sensitive antenna underwater movement and motion. They are wary of predators while tirelessly searching for food. Waiting for the right moment they are surprisingly quick clutching at unsuspecting fish or scurrying back into their holes as an adversary approaches. 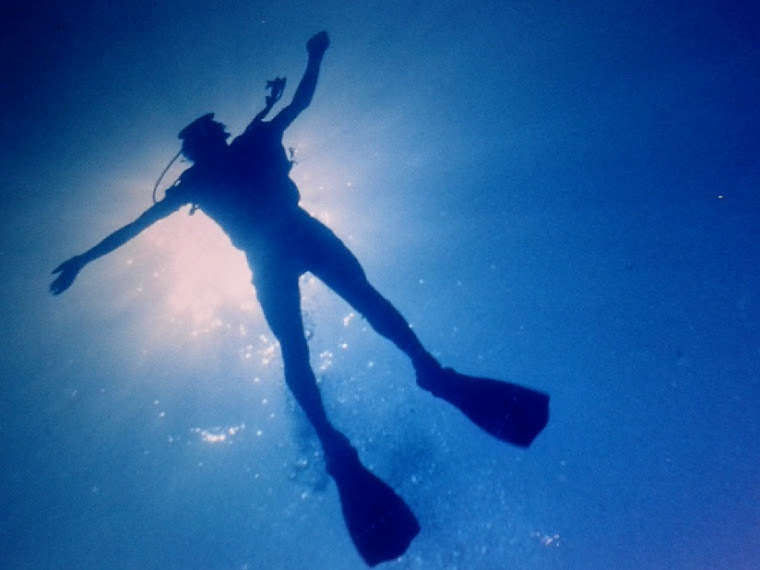 Dive hunters should be aware of unnecessary movement and practice control of their underwater advances. This is where lobstering becomes an art. Successful lobster divers command a stealthy approach fully focused on their own movements, anticipating the prey and foraging continuously from hole to hole. Little time is wasted over examining suspected homes. Some divers reach in crevices without hesitation sometimes pulling out sleepy eel pouts or red hake lounging in previously occupied homes. The less warning, the more likely you are to pull out the bug without any challenges. Over analyzing can lead to escapes or a tug of war battle where the lobster pins it’s powerful tail unmovable into the hole. 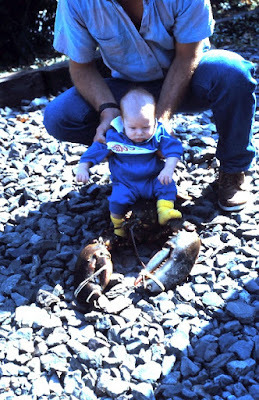 When this happens, the diver then may get grabbed himself or the lobster may give up a claw and escape. Knowing the terrain is advantageous. Lobster habitually return to the same spot. After one lobster is caught during migration, another will soon take it’s place. 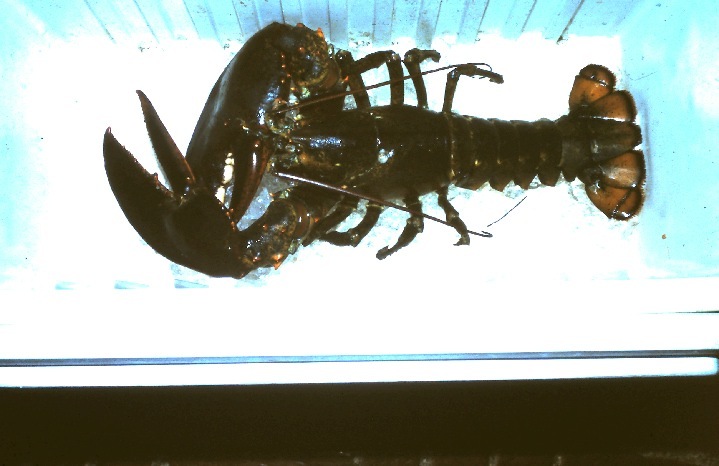 Returning to the same area lobsters will replace themselves year after year and be of similar size. They tend to replenish the offshore side of the wreck, where they return on their march back from the depths. 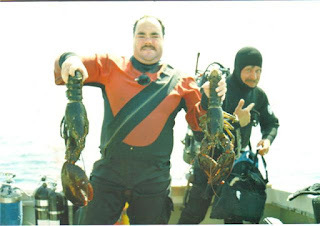 Divers that have caught lobster on a wreck will find by returning to the same spots they will enjoy equal fortune. Reach in. Go ahead. Getting the courage to stick your hand into a dark hole with two snapping claws is a adrenalin pumping rush. Reach high above the claws and grab the carapace. Once you get your hand on your first lobster twist and pull. If there is any snag let go for a second, regain your grip and continue to pull. It’s out and in your hand. Keep it away from vital parts and equipment like your mask and regulator hose. Know the difference between male and female. The female has a broader tail with soft appendages to hold eggs. If there are eggs (purple reddish berries) under the tail, carefully put her back in her home. If it is has no berries or a V notch cut out of the tail, measure the length of the carapace. Check with current laws to measure the minimum and maximum length allowed for your area. There are federal and state laws that affect your measurement. If the bug is legal, open your bag and slip the bug in tail first. Lobsters swim backward and will try to slip out if you open the bag too far. Keep hunting, when you reach your maximum limit you can always exchange the small ones for bigger ones. Be aware the bigger bugs will crush the little ones. Serious divers carry two bags to keep them separated. 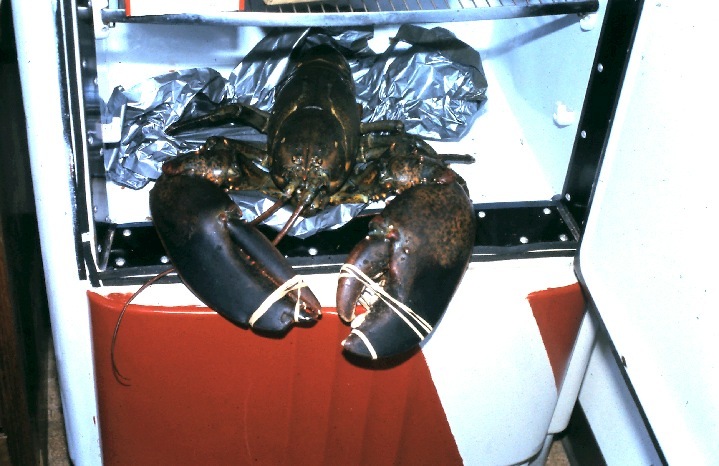 During the early summer months lobsters will be molting and are the most vulnerable. If you capture one of these softies you should put them back safely in their home where they will not become a fish meal. When you get on the boat, check your measurements again. It is easy to make a mistake underwater and you will do little damage if you get the short lobster back in the water right away. Eggs may be damaged by the pressure change and that is irresponsible hunting. Bug hunting is exciting and a long time diving pastime. Properly equip yourself, follow the current laws and successful bugging will provide you with many dinners. If all else fails dive at night. Lobsters are nocturnal feeders. They wander around in the dark hunting for prey and a new home. Your cooler could be that home too. Know the laws, limits and have proper permits. Only two claws are allowed per lobster body. Measure and re-measure to be sure. No gigs, spears, gaffs or mechanical devices are legal for capture. Keep your lobster on ice or submerged at depth below the thermocline to keep them fresh. Band your lobster to protect yourself, other lobsters and the cook.